ORDER by PHONE: You may order over the phone by Calling 1-352-688-8160 Monday to Friday between 10:030am and 5:00pm EST. JU-5135197AA Dodge RAM SRT-10 Seat Belt Extender. Factory Part designed specifically for the Dodge RAM SRT10 seat belt connector. Provides extra length at waist. Works on both driver and passenger side seats. Simply click in to your existing seat belt. It's that easy. JU-5135197AA-X2 Dodge RAM SRT-10 04-06 Seat Belt Extenders - Set of 2. 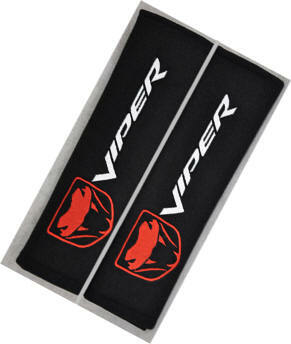 High quality seat belt padded pads with embroidered logo. Set of 2. Padded cushion right where you need it! Attaches with Velcro. Comes in color combination shown only. Fits 2.5" stock side belts.